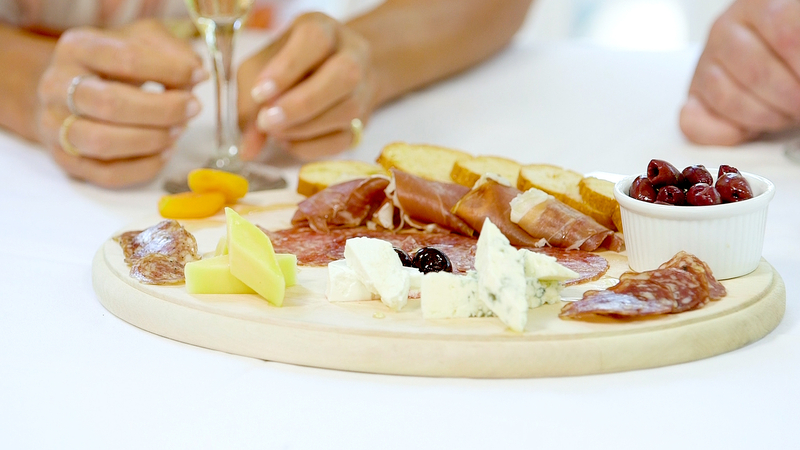 Kelly Bensimon Tries a Food and Wine Pairing: Watch Her ‘Travel With Us’! Rosé all day! Kelly Bensimon gets her wine on and continues our “Travel With Us: The Hamptons” series at Rams Head Inn on Shelter Island, New York. She’s pairing wine and food with the help of the Inn’s executive chef – Matthew Murphy. Watch the video above to see all the mouth-watering food and wine! Before a wine tasting, make sure you first know how to properly taste. “Swirl, smell and then sip,” Murphy advises Bensimon. Once you know how to taste, make sure you know how to pair it correctly with food. Murphy walks Bensimon through a three course meal she won’t soon forget! “We grab from the farms every single day. All of our produce and our ducks are local. We get a lot of our fish from Montauk,” explains Murphy. He pairs the local cheese and charcuterie with a local champagne that has notes of citrus. Champagne, he explains, pairs well with an appetizer because it’s light and airy. Murphy explains that when doing a wine tasting, you typically drink light to dark. So after champagne comes rosé! “Rosé is having an amazing moment right now. Apparently it’s the water of the Hamptons!” Bensimon exclaims. The chef pairs the scallops with the rosé because the buttery texture of seafood pairs nicely with a dry rosé. “Chef, this speaks to my Midwestern values! Meat and potatoes – I’m in heaven!” Bensimon is most excited for the third course. A salt-crusted filet mignon is paired with garlic potatoes, asparagus and crispy shallots, with a veal demi gloss. A heavier dish is usually best served with a dark wine, so Murphy pairs this one with Cabernet Franc, made from a black grape variety. Be sure to check out Bensimon’s new novel, The Second Course, available now!